Last August, the Extinct gang arrived in Calgary just ahead of this year's Society of Vertebrate Paleontology meeting. We met; we drank; we laughed. At one point the conversation turned to television and Adrian's eyes lit up. He asked: "Have you heard of The Good Place?" I had not. Little did I know at the time that I'd have some variation of that question asked of me at least a dozen times in the next four months. The Good Place is now doing for philosophers what Friends did for paleontologists twenty years ago: it serves as a cultural touchstone for professionals in the discipline. For better or for worse, we're in for decades of comparisons with that guy on that TV show. Is it for the better or the worse? It pains me to give a stereotypically philosophical answer, but: it's both. By considering what The Good Place and Friends get wrong about their disciplines, philosophers and paleontologists can develop a clearer picture of how to do well for themselves. As it will turn out, the pictures that philosophers and paleontologists develop will both have important elements in common. So, at the risk of overanalyzing pop culture ephemera, let's now learn how to be good philosophers and paleontologists by overanalyzing these TV shows. A couple of weeks ago I found myself in need of distraction as a pile of student essays grew on my desk. When my wife asked about that show with the philosopher on it, I sensed an opportunity to procrastinate in a way that would remind me that I should feel bad about procrastinating. Thus did I become acquainted with Chidi Anagonye. Portrayed by actor William Jackson Harper, Chidi is a PhD candidate in moral philosophy who dies and goes to the titular "Good Place" just before defending his dissertation on Kant's ethics. Chidi draws from his past as a graduate instructor to teach other characters on the show about moral theories. Described as a "kind, open-hearted" individual who "sees the good in people," Chidi is already something of a departure from real moral philosophers. 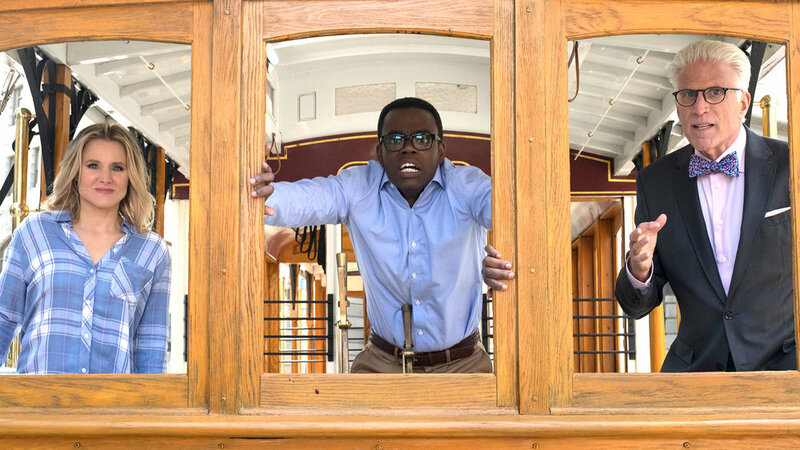 Chidi (center) contemplates the trolley problem from within a trolley. Image from nbc.com. In this departure from reality Chidi resembles Friends' resident paleontologist, Ross Geller. Ross was described as a researcher at the American Museum of Natural History and tenured faculty member at New York University, but I don't recall his research coming up much on the show. I do recall that he owned a monkey. The character was portrayed by actor David Schwimmer, but not by Columbus State University paleontologist David Schwimmer, who is like other paleontologists in not being very much like Ross. Both Chidi and Ross are bad examples of the professionals they represent, but that doesn't mean that they aren't good role models. In fact, consideration of what makes them bad disciplinary exemplars should be instructive for philosophers and paleontologists alike. Chidi and Ross stand at the extremes of a spectrum of bad character traits that professionals should avoid. Several paleontologists have already weighed in on Ross' quality as a paleontologist. On the one hand, there are signals that the character ought to be a singularly good professional in the field: we're told he has tenured appointments at two leading institutions at a relatively young age. On the other hand, what we're told probably matters less than what we're shown, and what we're shown doesn't reflect well on the character at all. Ross mishandles and misappropriates fossils, gets basic taxonomic information wrong, and makes a variety of claims about extinct animal behavior that are entirely unsupported by any evidence. But even worse than those are his more fundamental character flaws. He lies to students in order to impress them. He sleeps with a colleague. He sleeps with one of his undergraduate students. I'm pretty sure that it's illegal to own a monkey in New York. Ross might be a bad paleontologist, but the fact that he seems to be a generally bad person eclipses any consideration of his quality as a professional. Ross attempts to bribe an ex-girlfriend's boss with a dinosaur egg that he claims to have come from a pterosaur and there are so many things wrong with that sentence that I feel physically ill. Image from zimbio.com. By comparison, Chidi's faults are more subtle. As noted above, he seems to be a generally decent person. In his capacity as a philosopher, however, Chidi pushes the button of my biggest philosophical pet peeve. Chidi approaches moral problems with the implicit assumption that some moral choice is truly and objectively the right one to make. I'm amenable to that idea--I'm a moral realist myself--but the devil is in the details. In one episode, Chidi weighs a choice to cover up an accident by lying and decides against it because "Kant would say that lying in any scenario is wrong." A few episodes later, as a character struggles to find the value in moral action, Chidi remarks that the character is "going through an existential crisis. ...It's the first step towards understanding human ethics." One episode after that, Chidi resolves the Trolley Problem by reference to Bentham. While Chidi's descriptions of these theories (deontology, existentialism, and consequentialism, respectively) are correct, the context in which they're presented is deeply problematic. Given these various appeals to different philosophers, a naive viewer might think each of these theories uncovers some different aspect of the same moral truth, but that would be logically impossible: each of those theories contradicts the other two. Chidi might be a good person and a knowledgable student of philosophy, but he fails to communicate the most important and uncomfortable truth of ethics: that we always have to fall back on argument because the truth may be forever hidden from us. All things considered, Chidi's sin pales in comparison to Ross', but misrepresenting the discipline that you represent is nevertheless a fundamental problem. Let's think of Ross and Chidi as reference points, then: both are bad representatives of their disciplines, with Ross representing the worst of the worst professionals and Chidi representing a just-this-side-of-bad one. In the past month I've been working on a project that's gotten me thinking about what makes a good paleontologist. Given a small fragment of unidentified jaw from the University of Oregon's collections, I've been working to describe and identify the specimen. Preparing the manuscript has laid bare some of the more significant differences between paleontological and philosophical research. For one thing: paleontologists have to prepare images. Distinguishing bone from background is sometimes a bit of a judgment call. Image courtesy the author. These differences become plain in a comparison of the two disciplines' literatures. I've become accustomed to writing for philosophers; in order to write for paleontologists, I've first had to read a variety of descriptive papers to recognize the style that I'll have to mimic. The process recalls Aristotle's virtue ethics: to be good, one must observe and mimic good behavior in order to understand it. Unlike other familiar moral theories, virtue ethics places fundamental value on character rather than action. To do good requires that one first be good. Critics object that virtue ethics doesn't prescribe particular actions--"be good" isn't as helpful a direction as "don't lie"--but adherents describe that as a feature rather than a bug. Humans are rational animals, after all, and following directions doesn't require much rational thought. Instead, virtue ethicists such as Aristotle recommend learning good character by following the example set by a well-chosen role model. This is why the Chidi-Ross spectrum can be instructive. Each character models traits that good philosophers and good paleontologists alike ought to avoid. Ross is a bad professional (in part) because he's generally a bad person; we have a shared responsibility to avoid being total jerks. Chidi is not an exemplary professional because he fails to model the appropriate context for his discipline's work; a good philosopher avoids this specific mistake. There is an important epistemic feature shared between philosophy and paleontology that makes Chidi's mistake a useful model for paleontologists, too. Once we recognize that feature, we can recognize that the process of becoming a good paleontologist is fundamentally similar to the process of becoming a good philosopher. Both processes start by avoiding Ross' bad behavior and are completed by avoiding Chidi's error. Chidi mistakenly contextualizes all moral philosophers as arguing for the same idea; my experience in teaching philosophy suggests that students who make that mistake do so out of fear of error. They're (rightfully) hesitant to make empirically unverifiable assertions and so rely on appeals to authority to justify their beliefs about ethics. More experienced students overcome this fear: they understand that our best efforts to find conceptual truths are always prone to empiricist doubts and find ways to work around that problem. This is how they avoid Chidi's mistake. Both philosophers and paleontologists share an inability to observe the truths they seek, and so paleontologists must overcome similar fears. Just as the truths of philosophy are obscured by abstraction, so too are the truths of paleontology obscured by geological time. A paleontologist's reconstruction of the distant evolutionary past is always limited by her inability to observe her object of study; if she hopes to succeed, she must overcome the inevitable doubt raised by that limitation. She, too, must avoid the fears that lead to Chidi's mistake. The details may differ between disciplines, but the general course is the same for philosophers and paleontologists alike: don't be Ross, then don't be Chidi.